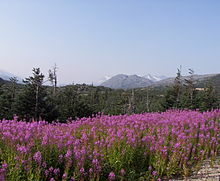 Fireweed is prominent in various locations on the Klondike Highway (this is in the vicinity of Summit Lake and Bernard Lake in British Columbia). The Klondike Highway winds in the state of Alaska for 24 km (15 miles), up through the White Pass in the Coast Mountains where it crosses the Canadian border to British Columbia (BC) for 56 km (35 miles), then enters Yukon where it reaches the Alaska Highway near Whitehorse and shares a short section with that highway until north of Whitehorse, where it diverges once more to Dawson City. The highway is 712 km (442 miles) long. The Carcross-Skagway Road portion of the highway underwent substantial rerouting, widening and (cold mix) paving in the late 1980s and early 1990s. Mining ore trucks and fuel tankers are the primary current (2013) commercial users of the highway, which also remains a popular tourist route (cars, RVs, buses), and provides a means for the WP&YR to offer economically-priced train excursions connecting at Fraser to buses based at Skagway for the cruise ship industry, or to/from Carcross and Whitehorse to the north. The quality of roads from Whitehorse to Dawson City prior to 1950 was poor and only for the hardiest of travelers and motorized vehicles. The "Whitehorse-Mayo Road," Yukon's original Highway 2, extended along today's route from Whitehorse to Stewart Crossing, then turned northeast to Mayo, Elsa and Keno City. The last of three bridges was finished in 1960 to replace ferries at Carmacks, Pelly Crossing and Stewart Crossing. Yukon's original Highway 3, the Dawson-Mayo Road, was opened in September 1955 between Stewart Crossing and Dawson City. 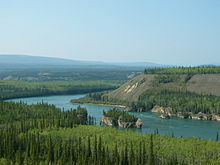 The Dawson-Mayo Road became part of Highway 2 in 1978 and was named the Klondike Highway, while the road northeast from Stewart Crossing became Highway 11, and was later named the Silver Trail. Even as of 1979, the entire Klondike Highway was gravel, but by 1982, some paving had been laid down as far north as Carmacks. Rebuilding and some rerouting was completed in the late 1980s. Approximately, the first 30 km (19 mi) of the North Klondike Highway are still often known as the Mayo Road to the residents of Whitehorse. Although kilometric distance markers have been in place since the early 1980s, residents in this area still identify their residential address as a mile measurement along the Mayo Road. The entire route is in Skagway, Skagway Borough. Internet travelog of Jim Teresco. Specifically Skagway, June 23, 2001, pictures 11 and 12 and their associated captions. Retrieved 2005-02-18. This page was last modified on 24 May 2016, at 01:53.